Celebrate with our NEW Confetti Fruit Cupcake™ arrangement, featuring cupcake-shaped pineapple dipped in gourmet white and semisweet chocolate with rainbow sprinkles. 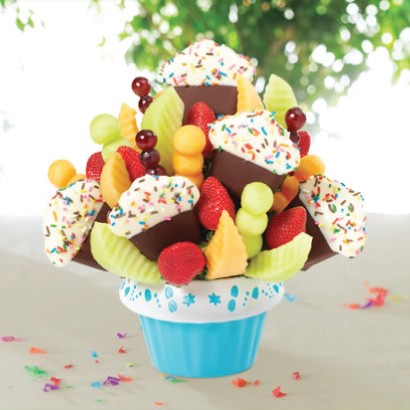 It’s filled with an assortment of fresh fruit favorites: cantaloupe, honeydew, strawberries and grapes. It’s all artfully arranged in a custom cupcake container for the sweetest presentation yet. Container and color may vary.